be available to sing in San on July 12, 2019 at SDCCU Stadium with a 12pm sound check and 7pm performance. *Every contestant is REQUIRED to send an email to info@calstategames.org that contains your name, address, age, phone number, and email address. Congratulations to Sanlyn Carter! Sanlyn will perform at the 2018 California State Games Opening Ceremonies! National Anthem singers are considered volunteers of the Games and the winner will receive a complimentary volunteer t-shirt, free parking and 10 general admission tickets to the Opening Ceremonies. 40% of score: Finalist rankings determined by number of fan votes made through the CSG Voting Page after May 1st. The finalists will be determined by a panel of judges after May 1st, and finalists’ videos will be posted to the California State Games Voting Page and shared on social media. The public will be able to vote for their favorite finalist through the CSG Voting Page. Finalists and fans are encouraged to share their video and spread the word on social media and promote the CSG Voting Page. After voting closes, the winner will be determined by judges ranking (60%) + votes ranking (40%). The winner will be will notified and announced on social media. 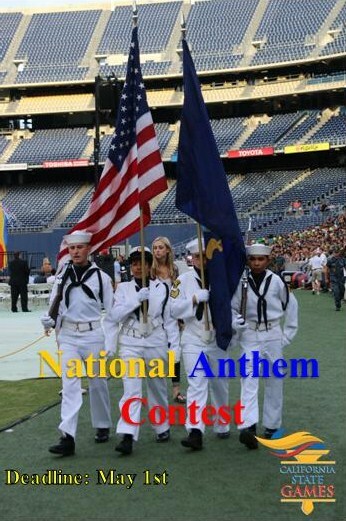 Some of CSG sports competitions have opportunities for volunteer National Anthem singers throughout the weekend of July 11-14. After the contest, a Cal State Games representative will email local finalists with sports competition opportunities. Good luck and we look forward to receiving your entry!